I love how her hair keeps coming loose and falling in her face. It's an amazing detail. the distant periods they have lived through--between which so many days have ranged themselves--they stand like giants immersed in Time." and maybe this is part of the point. Wow, does this have the possibility to turn into comic 915 or what? "Personally I believe slide number 52 (according to the Aubron Wood chronological classification system) is automatically in the top ten, due to the sheer originality of the introduction of text - before which it was unknown if the series would contain any." benjaminswill wrote: Wow, does this have the possibility to turn into comic 915 or what? What a surprise - you praising a text frame! Haha that's exactly what I thought of as soon as I started reading this thread. Sorry, they wouldn't be lying on it and wouldn't be checking the temperature of water. It can be snow, and snow angels, and checking ice thickness. Loving the comic and the thread enough to sign up just to join the club. Edit to add warnings. (Twice) And once to update the warning now that page 25 is safe. Last edited by SBN on Fri Jul 03, 2015 12:03 pm UTC, edited 3 times in total. I have been watching this since the first or second image... and all along, I kept thinking of this song. I Finally figured out where I had heard it. Now what is he doing? Envelope Generator wrote: Has anyone scoured Wikipedia in search of the exact real-life medieval castle they're reproducing? Someone has to be on it by now. I'm one of the people who just registered today. I've been reading XKCD for a long time but never knew about the forums. I'm enjoying the discussion about Monday's comic almost as much as the comic itself! Wonder what they are doing now? I was hoping this time there'd be something different, since the castle looks mighty fine already. Maybe they will build an army? Maybe another tower in the center of the big square section? Wait. I just realized the guy is on the other side of the castle than the girl. Clearly Randall is signalling to us that he is gassy and his wife doesn't want to be in the same room as him. Mgraba wrote: I was hoping this time there'd be something different, since the castle looks mighty fine already. Maybe this is just the beginning of the castle -- perhaps a tall tower awaits us in the future. I was kinda hoping she was building a bigger sand castle to protect the one they built together. Oh, how I (former lurker, hi!) look forward to seeing the comic change, and how I hope even more that it will change on the mobile version too (thus avoiding a #1174 (how nice it is to feel in the know) situation). I personally am finding that I am much more productive today. Half an hour is about all I can sustain focus for anyway So I write like mad for half an hour, then check for comic and forum updates, and go back to my writing feeling much refreshed. Like a mini zen moment. As an update as to the forum statistics for this thread, I would like to announce a WINNER!!! This thread is now the most viewed comic thread on the forum. KroniK907 wrote: Maybe they will build an army? Hells yes for the tower prediction!! Mine... Mine didn't update. I got scared when no one posted the update. But it's okay now. It just did, finally. Not sure if some of the coding geniuses earlier in the thread have already answered this but... Do I have a browser issue on my end? is it regional thing? or something else? People are able to screen-grab and update the forum a minute or two before the comic itself updates, whether I refresh the comic page or not. 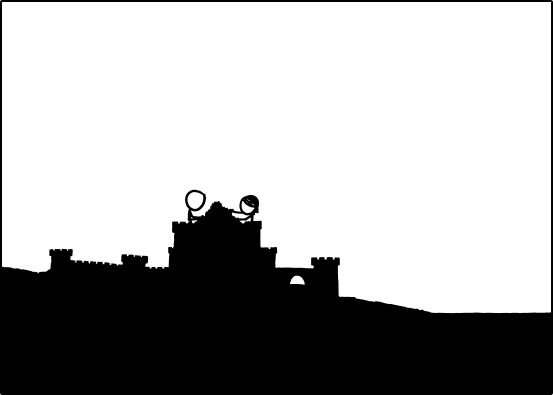 I think for the next day they should build in the other direction, into the page, when is a sandcastle ever two-dimensional? free-bee wrote: Mine... Mine didn't update. I got scared when no one posted the update. But it's okay now. It just did, finally. It wasn't just you; mine didn't even change the first time I hit refresh. Had me worried; this certainly isn't a natural ending point. same here for the last update. Soup wrote: Tower of London? I think this is a very good guess. Aren't the larger sand sculptures usually built top down (create a giant pile of sand and cut away the uneeded bits), so as to avoid the need to step on/around the completed areas? If they are going to attempt to build a tower, they may end up destroying their existing work. I realize the castle wasn't planned, but I would think they are getting towards the limit of what can be done without planning it out in advance. The http://uni.xkcd.com/ has worked well for this comic. Though it would be better if I could figure out how to scroll. I think it is going to last a full week, and possibly punchline on april first. Beatrice The Golden wrote: Alright! The fun continues! Since the story is developing nicely - the girl is building a bigger sandcastle and the boy is back to help her - let's tackle the other aspects of the story. I have few more assumptions. I prefer not to make assumptions so could you help me out here? Is the girl the one with the short hair or the long hair? Hm, how many people with hair do you see there? Blitzers: the seventh post on the next page (after SWuh's and before SWuh's (yes, that's right)) contains an unspoilered current frame. Be advised. Last edited by AluisioASG on Tue Dec 03, 2013 1:56 pm UTC, edited 1 time in total. cream wobbly wrote: I prefer not to make assumptions so could you help me out here? Is the girl the one with the short hair or the long hair? So, how do we know that the guy who's helping the girl now is the same person as the guy who left earlier?